1/9 Debris Flow that covers the 101 Freeway in Montecito. With both natural and man-made disasters occurring more frequently and with greater severity, the need for financial resources to support nonprofit and government response and recovery efforts is growing exponentially. The Community Disaster Relief Fund at the Santa Barbara Foundation is built to address this need and is activated in the aftermath of an emergency to support nonprofit organizations in short-term and long-term recovery. 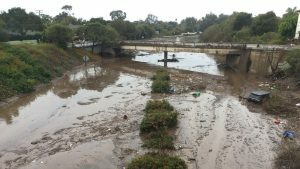 Over a year ago, Santa Barbara County was impacted by the Thomas Fire and 1/9 Debris Flow. Our communities are still working to recover and rebuild as well as manage the trauma and stress from such a catastrophic event. To provide the financial assistance to organizations actively engaged in recovery efforts, the Community Disaster Relief Fund was activated. The Santa Barbara Foundation is pleased to facilitate a second distribution of funds with generous support from individual donors and local, statewide and national foundations. The Community Disaster Relief Fund grant program is now closed. For more information on the Community Disaster Relief Fund please contact Melissa Park at (805) 963-1873 or mpark@SBFoundation.org. A final report submitted electronically to the foundation is due approximately four weeks after completion of the grant-funded project, or no later than 13 months from grant award date (refer to your grant award letter for report due date). If you need additional time to complete the project, please consult with, Melissa Park, for approval and additional instructions.